Basel has many merits, but being beside the sea is not one of them. However, the city does have a secret weapon: the Rhine. When the mercury hits the mid-30s as it’s currently doing in our ‘hood (not complaining, mind), thoughts turn to finding the best watering holes beside the river. Now that the weather’s glorious and the water’s lovely – remember, it starts right up there in the Alps so it takes a while for it to warm up – you can make like the Baslers and take a dip. Some good safety tips here, in case you’re doubtful about flinging yourself into the water. Here’s a selection of fun places for a meal or a drink that I covered on the latest English Show (Tuesdays from 6.30 – 8 p.m. on Radio X, 94.5 FM in the Basel area dontcha know). 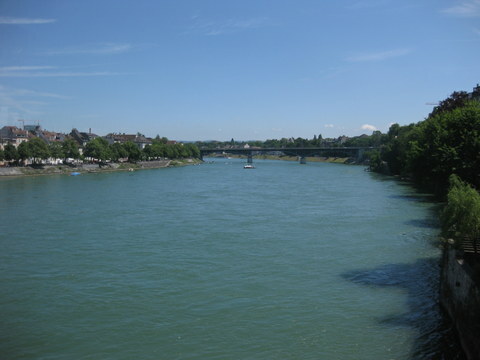 Here are my suggestions for three restaurants on the banks of the Rhine, one in Basel/Switzerland, one in Village-Neuf/France and one in Weil-am-Rhein/Germany. (Love the fact that living here, we have all three countries at our disposal.) And if you do decide to take a dip, don’t even think about swimming from one place to the next: you must NOT cross the Rhine when swimming, but always stay close to the bank on the side where you went in. Restaurant Veronica, St Alban-Rheinweg 195, Basel, Tel. +41 61 311 25 75, open April to September. An open-air restaurant (with sheltered seating even if it rains) that sits out on stilts right in the Rhine, just about opposite Roche and a little downstream and across the river from the Tinguely Museum. Daily-changing menu, salads and light lunch dishes, afternoon teas and a Mediterranean menu for the evenings. If you want to take a dip, this is the place. Get a locker, change and leave your stuff, walk up to the bridge just opposite the Tinguely Museum and get in there. Float down to the Veronica (Rhine ‘swimming’ is more a question of bobbing about, no swimming needed on account of the current), get out, retrieve your kit and have lunch/a beer/Kaffee und Kuchen or supper. Take Tram #3 and get out at Waldenburgerstrasse, or Bus #36 and exit at Breite, then walk down to the Rhine. Fun, buzzy riverside resto-café with a huge terrace right on the river and deckchairs out front so you can hunker down and watch the barges sliding sleekly past – even the occasional river cruiser. There’s a daily-changing lunch menu, some blackboard suggestions and plenty of à la carte options. 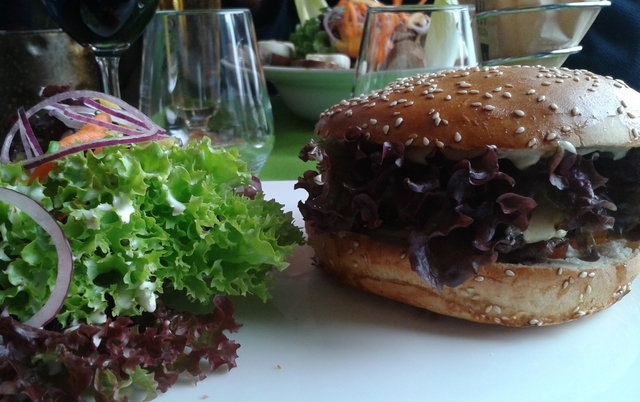 Their burgers are famously brilliant (see here for a longer exposition on French burgers in general and La Piste’s in particular), as are the ice creams. Park right outside the door, or come by bike from Basel, or cross over from Weil to Huningue on the Passerelle des Trois Pays and walk or cycle along to the restaurant – the address is Village-Neuf, but it’s actually quite close to Huningue. I have to come right out and admit that I’ve never actually eaten here but I’ve had a great Weissbier on the terrace, which you’ll stumble right onto if you walk across the Passerelle des Trois Pays footbridge from Huningue: it’s at the end of the bridge on your left. Alternatively, if you’ve survived a shopping session at the nearby Rheincenter, then you’ve definitely earned yourself a drink (or three) – it’s just round the corner from that palace of horrors (aka huge supermarket and shopping mall). The food – you guessed it – is Chinese and I’m reliably informed that it’s abundant and cheap. On some days they do what’s usually called a buffet à discretion, but which should more properly be named buffet à indiscretion. Previous: Previous post: Do Anchovies Grow Up To Be Sardines?